Blue Bay Village is one of the best properties listed in Cyprus44 property reviews. 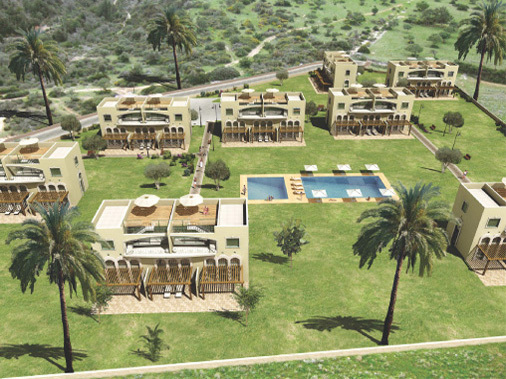 The Evergreen Developments group built quality apartments and villas in prime locations in Northern Cyprus. Their international team has wide-ranging experience in the property business, and the group boasts a high level of technical expertise in construction. The group is currently developing no less than nine different sites in North Cyprus, including the Blue Bay Village and various Crystal Bay developments. Blue Bay Village is a small development of just seven apartment blocks, with a total of 21 garden apartments and 14 penthouses. The site overlooks a lovely bay with a sandy beach, so you are just a few minutes' walk from digging your toes into golden sand and paddling in the Mediterranean Sea. The Blue Bay Village apartments in Northern Cyprus are also just a few minutes drive from both the new Korineum Golf Course and the planned Port Cyprium Marina, so they are ideally placed to take advantage of the growing numbers of tourist who will flock to this area in the future. 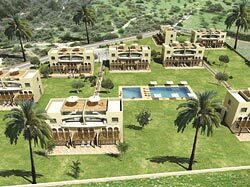 The apartments at Blue Bay Village in the TRNC are arranged in a herring-bone fashion along the sides of the pool area, except for block A which is the only one to directly face the sea. The apartments are generally well laid out, with large terraces and well-lit living spaces giving the apartments a particularly spacious feel. Combine this with a design for the garden apartments that puts the master bedroom and second bathroom upstairs, and these apartments feel more like designer town houses. The penthouses have all the living space on one floor, but offer a substantial private roof terrace as well for outdoor living and dining. The facilities at Blue Bay Village include a swimming pool and separate children's pool, outdoor jacuzzi, gym, plus tennis and volleyball courts. You can either buy your groceries on site at the mini market, or forget cooking for the night and dine at the Blue Bay Village restaurant. For those wishing to rent our their apartment in between visits, there is an on-site maintenance and letting office ready to help you get the maximum from your North Cyprus apartment investment. Overall, the apartments at Blue Bay Village certainly look more elegant than some of their more unimaginative rivals, but the garden space is more of a small grass patch than a true green garden. However, the future potential of the site and the clever design has probably ensured that, at the time of writing, only two garden apartments remain unsold. If Blue Bay Village takes your fancy, do ask the developers about resale opportunities, which will no doubt arise as the build progresses. This web page is served on 20 April 2019 at 00:00:39.